Real foodies can still celebrate the holidays with a cookie exchange! Here are some of our favorite healthier, allergy-friendly recipes. It’s that time of year: Christmas Cookie Time! If you love enjoying a wide variety of different homemade cookies but don’t enjoy the amount of time it takes to make them, why not host a cookie exchange this year? 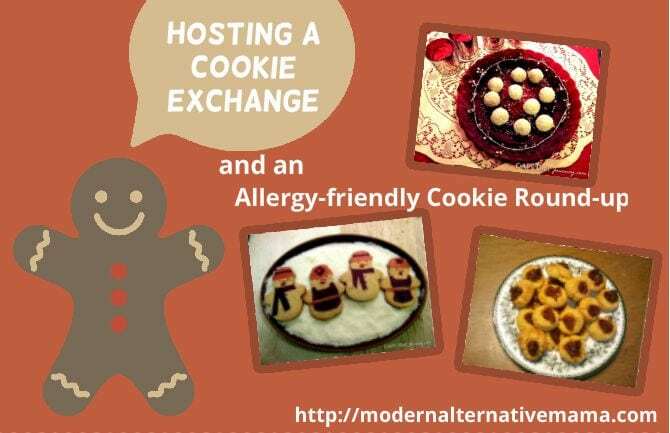 If you prefer to have a healthier, or perhaps more allergy-friendly, exchange, check out the bottom of this post for gluten-free as well as sugar-free Christmas cookie recipes. Decide if you want to limit the type of cookies you want at your exchange. For instance, you may want only Christmas type cookies (for instance, no chocolate chip, etc) or perhaps you only want gluten-free cookies. Do you prefer that everyone bring homemade cookies? Make that known! If you don’t want any no bakes and prefer each guest spends around the same amount of time and effort, you will want to include that info. If it doesn’t matter to you as much than skip it. It’s probably a good idea to have everyone bring a container to take their cookies home in. Using parchment paper to line your cookie sheet will ensure they don’t stick to the pan and will help you avoid over browning the bottoms of your cookies. Plan on baking your cookies for the exchange two to four days before. The cookies should sit out overnight to release excess moisture. Store in airtight tins in between layers of wax paper and they will last up to a few weeks and remain fresh. Just make sure to keep them in a cool, dry place. Cool your cookies on a cooling rack overnight with a sheet of wax paper loosely over them. This will ensure all of the moisture is released and will help your cookies to remain fresh for about 3 weeks. I’ve curated a list of gluten-free and sugar-free Christmas cookie recipes for those who are in need of these types of recipes. There are also 3 cookbooks that include gluten-free and sugar-free recipes. What are your favorite holiday cookie recipes? Thanks for sharing my coconut sugar cookie cutouts!